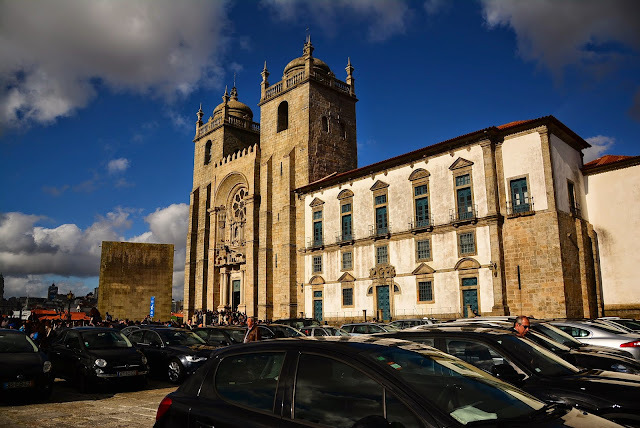 'What is there in Porto' is the question we faced a lot when we planned our trip to this second largest city of Portugal. To be honest we too were a bit apprehensive when booking the flight but we could not resist the offer that Air France threw at us. 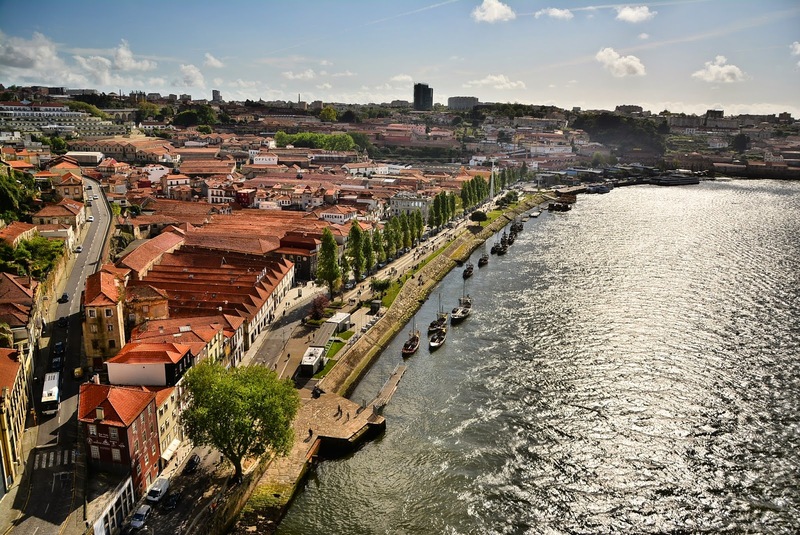 We found some solace in the fact that Porto was listed as the top destination in Europe for 2014. We started preparing ourselves for the trip which was to last 4 nights. 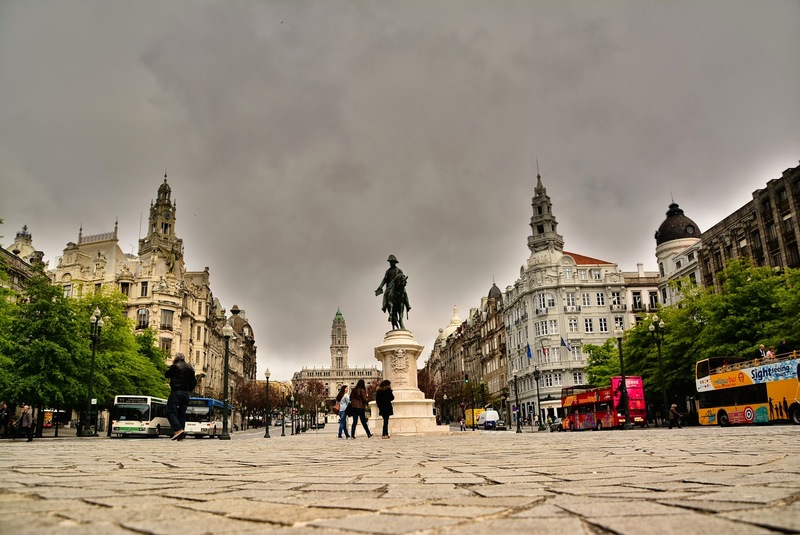 Finally we realized that even 4 nights in this city may not be enough to explore the richness of culture, cuisine and natural beauty that Porto beholds. The trip was scheduled in late April and there are very few spots in Europe where one can expect bright sunny weather during this period. Portugal is one country which can boast of high numbers of sunny days and so choosing Portugal for the vacation was justified. However the weather forecast for the week of our vacation was not very promising but we soon realized that like most places on the Atlantic coast, in Porto too, in spite of all the modern technology it is not possible to predict the weather in advance. Set up by the Romans (or the Greeks) who named it Cale, which can mean either warm (in Latin) or beautiful (in Greek), the Port of Cale today embodies both those meanings. The name Portugal is an offshoot of this name Portus Cale which was meant to represent the area between the two rivers, Minho and Douro, with the former forming a natural border between Spain and Portugal and the later flowing along the city of Porto. We took the flight from Paris Orly airport at around midday and after a two hours flight we arrived in Porto at around 14.00 local time. The airport of Porto is well connected to the city by metro and within 40 minutes we arrived in the "Cidade Invicta" (Unvanquished City). This title was given to Porto in 1833 when it successfully withstood a 18 months siege of Miguel I, the then King of Portugal who wished to curb the growing liberal revolution against the monarchy in Porto. The first thing we did after a quick brunch is take a walk on the Dom Luís Bridge. Porto is a city of bridges with many of them crossing the Douro river to the Vila Nova de Gaia in the south across the river. This bridge is located at the site where an earlier bridge called the Ponte das Barcas stood that collapsed under the weight of the people of Porto fleeing the Napoleonic troops in 1809. This event is marked on the present bridge by a plate commemorating the horrific event. The Dom Luís Bridge at the time of its construction in 1886 was the longest of its type in the world. It has two decks with a metro line passing over its upper deck. From this upper deck one can have a beautiful view of Porto and Vila Nova de Gaia and it leads to the foot of monastery of Serra do Pilar in Gaia. The wind at this height of 45m was too strong but we somehow held on to admire the fascinating sight. It is not easy to get down from here and as a passerby remarked, jumping may seem to be the best way to get to the lower deck from here. However we later discovered that a cable car on the Gaia side of the bridge that goes down to the waterfront at a cost of €5 one way while on the Porto side, we have a funicular leading down to the foot of the bridge at €2 one way. The historic center of Porto like most European cities is not too spread and can be almost covered on foot. Yes I mean almost if you do not consider the elevation of the city. In fact the historic center is laid out on the mouth of the Douro river with the waterfront at sea level while the highest point of the city at 100m. Thus a walk through Porto can often mean ascending and descending these hundred meters through wide lanes, cobbled stone alleys or wide varieties of stairs. At our hotel Ibis Porto Center, we came across a sightseeing tour that included a hop on hop off bus ride through the historic center for 2 days, a boat trip on the Douro river and a visit to one of the caves of Port wine in Gaia (Calem) all at €22 per person. This seemed quite useful to have a overview of the city and get acquainted with the geography of the place for the first two days and then explore the sites on our own the last day of our vacation. The transport system of Porto is quite efficient with 6 metro lines, numerous buses criss-crossing the city and some heritage tram routes, one of which runs along the Douro, where one can feel the nostalgia of riding an early 20th century street car. The landscape of Porto is dominated by towering churches. The most evident feature of these churches is their baroque architecture adorning the exterior and their ornate interiors. The word baroque is derived from the Portuguese word "barroco" or French "baroque" which refer to a rough or imperfect pearl. Baroque architecture begun in late 16th-century Italy and spread to other parts of Europe and is characterized by new explorations of form, light and shadow and dramatic intensity. 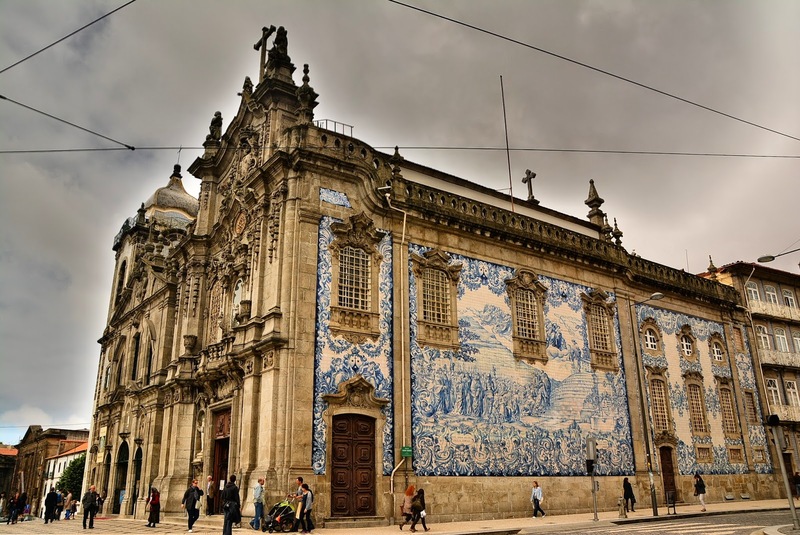 Most churches in Porto can be noted for their polychrome ornamental patterns, undulating roof-lines, irregularly shaped window surrounds and baroque inner decorations of gilt wood work (talha dourada in Portugese). The best example of such baroque interior design can be found inside the Gothic Church of São Francisco built by the Franciscan Order in the 15th century. The entrance fee here is around €3.50 and it is unfortunately not permitted to take photos inside the main chapel. However we were so engrossed in cherishing the gorgeous work of gilded wood carvings that we hardly felt the disappointment of missing the opportunity in capturing the marvel in our cameras. The main cathedral of Porto (Sé do Porto) is perched at the highest point of the city and is one of the most important Romanesque monuments of Porto. Completed in the 13th century it is architecturally heterogeneous with a Baroque porch and a beautiful Romanesque rose window under a crenelated arch, give the impression of a fortified church. It also has a Gothic cloister, which was decorated with baroque azulejos by Valentim de Almeida in the 18th century. There is an entrance charge of €3 per person to admire this azulejos work. Azulejo is a form of Portuguese or Spanish painted, tin-glazed, ceramic tilework that was introduced in the Iberian peninsula by the Moors in the 15th century and was taken to its ultimate glory by the Portuguese. It has become a typical aspect of Portuguese culture, having been produced without interruption for five centuries and elegant baroque architecture with painted blue tiles now dot the landscape of Portugal. We were charmed by all the intricate blue artwork around us and some of the best of such art can be seen inside the station Sao Bento and on the eastern facade of Carmo Church. Sao Bento Railway Station is a historical station located in the Almeida Garret Square, in the centre of the city and is served by suburban trains operated by Comboios de Portugal. 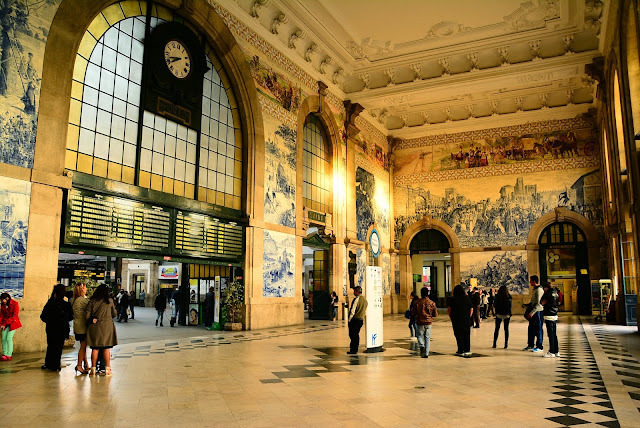 The azulejos works inside the station depict scenes of the history of Portugal. In the early 18th century, Portugal saw a rapid growth of trade mainly owing to its treaty with England, and given the strategic location of Porto on the mouth of the Douro river, it soon became the center of the industrial urbanization of Portugal. This added to the city some new architectural styles with many foreign architects decorating the city. Between 1732 and 1763, Italian architect Nicolau Nasoni designed a baroque church with a tower which has now become the architectural and visual icon of Porto, the Torre dos Clérigos at 75.6m, towers over the historical center of Porto. French architect Gaustave Eiffel better known for the Parisian tower added a wrought iron bridge Ponte D. Maria over the Douro in 1843. This period also saw the development of the Liberdade Square where one can find some of the best Neoclassical architecture of Porto, the adjacent avenue of Aliados with the Porto city hall at its end and the rococo (late baroque) Episcopal Palace of Porto, the former residence of the bishops of Porto perched above the city near the Se cathedral. The Art Deco style can also be found in Porto in the Rivoli theater built in 1923 and we were amazed to see groups of young painters sitting in the drizzle in-front of it and busy sketching the facade of the theater. From our experience in Porto we would advice one to take an unplanned stroll through the narrow, a bit shabby and cobbled stone lanes because there are hidden beauties to find in these alleys. You may well end up finding a work of azulejos, or a lesser known but stunning church with baroque interiors, the joint facades of residential buildings with clothes hanging from the balconies, a hidden UNESCO world heritage site or an open terrace with a panoramic view of the city of Porto and Gaia and the Douro flowing in between. One such splendid alley leads from the Campos Mártires da Patria square down to the most popular square of Porto, the Ribeira square located on the Douro river. 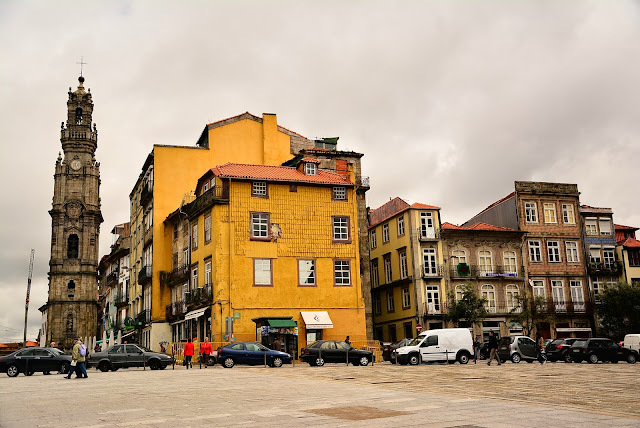 The Ribeira Square is a historical square in Porto and is included in the historical centre of the city, designated World Heritage by UNESCO. The square used to be a center of intense commercial and manufacturing activity since the Middle Ages and the houses on the square were rebuilt in 1491 after being destroyed by a fire. In the late 18th century the square underwent a re-urbanization and was rendered to the form it is today by John Whitehead, English consul in Porto. The square also hosts a monumental fountain three storeys high built in 1780 decorated with the coat-of-arms of Portugal and a modern statue of St John the Baptist by sculptor João Cutileiro. 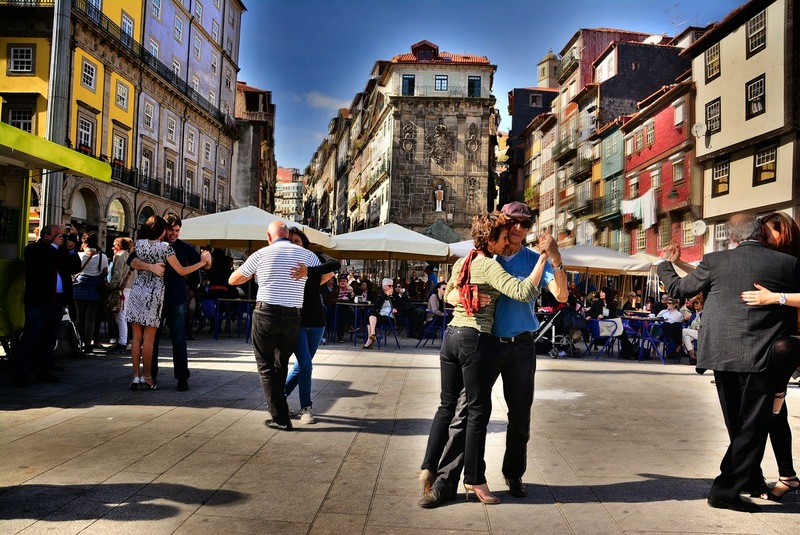 The square is really an ideal location for a romantic walk and our romance was enhanced by couples dancing to the Portuguese Fado music. From the Ribeira (riverside in Portuguese) one can have a clear view of the Douro river with Rabelo boats sailing or anchored on it. 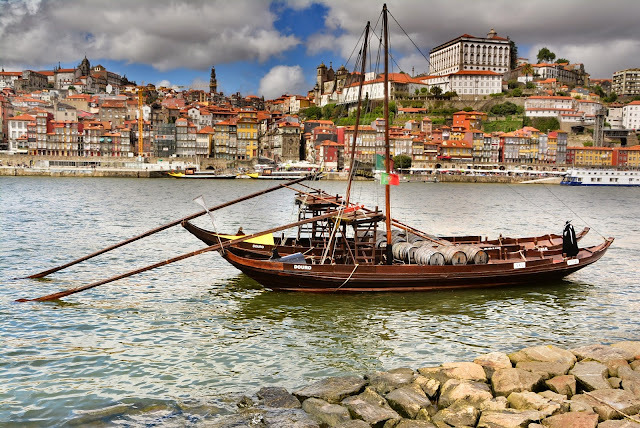 The Rabelo boats are traditional boats that have been used to transport people and goods along the Douro and notably Port wine (Porto, the namesake of the city) prepared in the Douro valley upstream and brought here in the estuary to be aged in the cellars of Vila Nova de Gaia. It is here that all the Porto(DOC) found in the world must be aged. Porto is also not short of scenic beauty with the Douro river flowing into the Atlantic ocean. The western edge of the city is flanked by the raging ocean and the neighborhood of Foz do Douro (mouth of Douro) is a beauty to behold with avenue do Brasil running along the ocean. 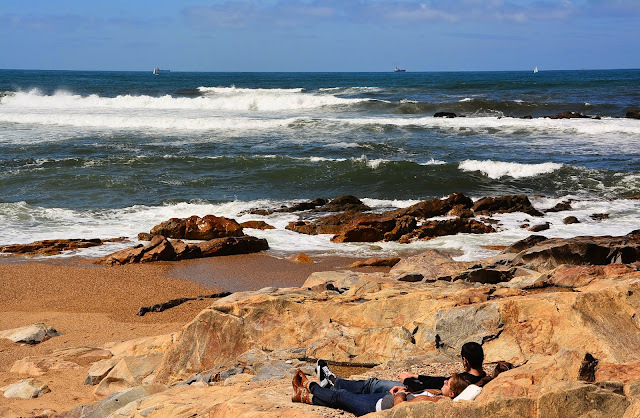 There are some magnificent beaches in Porto with the more famous ones in the north-western suburb of Matosinhos. 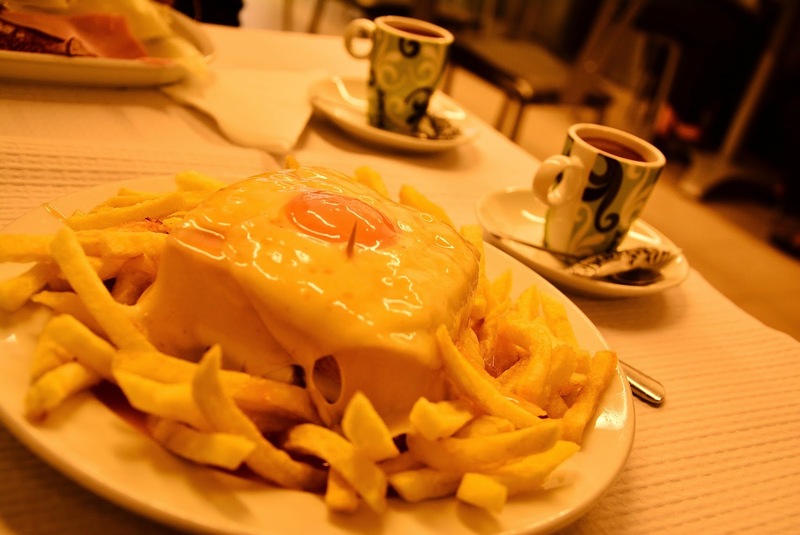 Francesinha : Literally meaning the Little French Girl was believed to have been inspired by the French croque monsieur. It is a sandwich with meat covered with cheese and a special sauce. The local favorite place to taste them is at Cafe Santiago which boasts of a 80 years tradition and we really found the one here delicious and loved it more than the original corque monsieur. Tripas à Moda do Porto : This is quite famous and traditional in Porto. 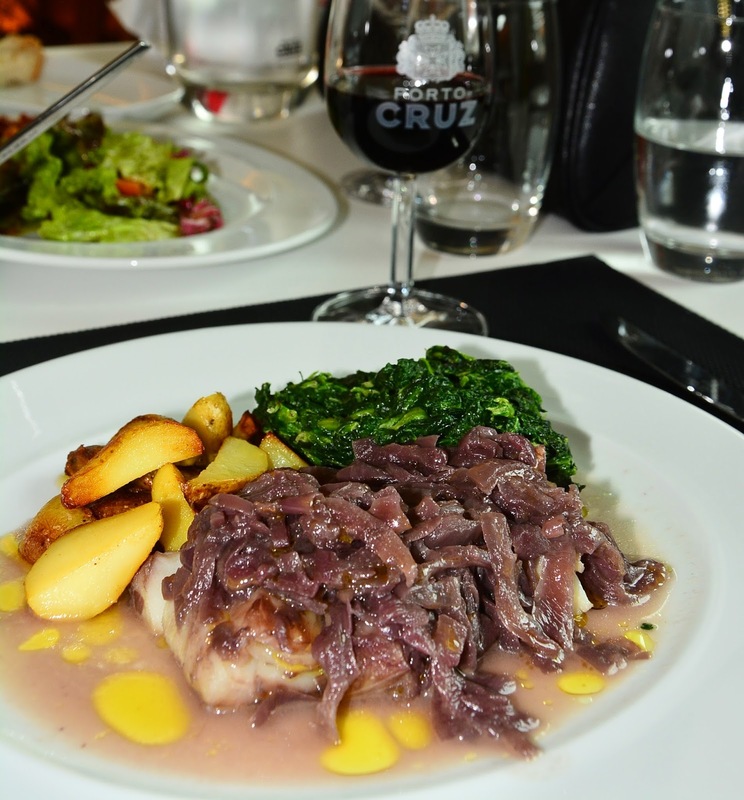 Legend has it that during the age of exploration the best meat cuts in Porto were send on the sea faring vessels and the offal was left behind for the local population and that local population created this enticing dish from the left over beef stomach. Though eerie it may sound it is a delight to taste like other tripe dishes available elsewhere in the world. We tried it at the historic Cafe Majestic which is also a favorite tourist destination of the city. On the 17th December 1921, an establishment called Elite café opened for business in Porto. It was located in Santa Catarina street, a pedestrian walkway for shopping and for the finest members of society, then and now. The café enlightened the street with its Art Nouveau decoration, by architect João Queiroz. The glamorous cultural elite from Paris was a reference for portuguese culture in those days and hence the new name 'Majestic' – filled with all the charm of "La Belle Époque". Bacalhau : It is the Portuguese name of cod but the cod in Portugal is eaten dried and salted. This also owes to the sea faring heritage of the Portuguese and the fact that dried and salted fish lasted longer. There are a plethora of dishes based on Bacalhau and we tried a few of them. In Vila Nova de Gaia there is a restaurant of the Port wine house Porto Cruz and there we tried the signature dish 'Bacalhau à Gomes de Sá', a casserole of bacalhau, potatoes, eggs, olives, olive oil and onion. Apart from it there is also a popular finger dish, the fried cod balls which serves as a filling snack. Cod salads and Bacalhau fried with eggs is also delicious and popular. Fresh catch of the Atlantic : Porto also is home to some of the best fresh fishes caught in the Atlantic ocean such as the salmon, sea bass, dorade or sole. 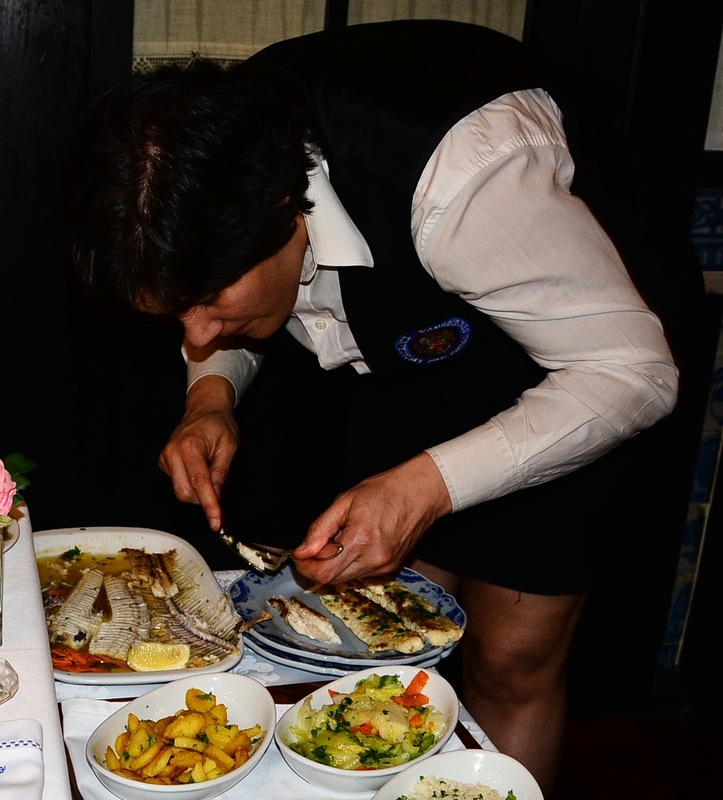 We tried the sole at the heritage restaurant Escondidinho which is based in a historic manor house, the sea bass at the cafe Majestic, the dorade at Farol restaurant in the Ribeira overlooking the Douro and the salmon at a small cafe in one of the alleys Porto. All of them were really fresh and juicy and delicious to say the least. Portuguese Desserts : The most popular dessert here is a traditional pudding which we tried at the Cafe Santiago and the Cafe Majestic. Both the dishes were a bit different and then we came to know that this dish has many variants but the luscious aspect was common to them all. 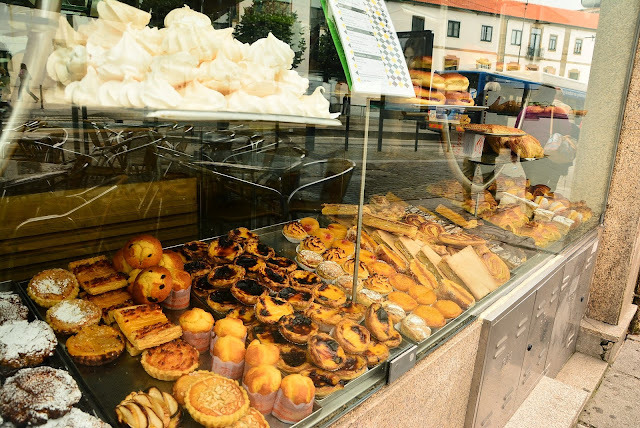 The iconic dessert of Porto is the Pastel de Nata which is a Portuguese egg tart pastry and we filled up ourselves with this yummy delight everyday during the breakfast at our Ibis hotel. Wine, produced in the Douro valley, was already in the 13th century transported to Porto in barcos rabelos (flat sailing vessels). In 1703 the Methuen Treaty established the trade relations between Portugal and England and the production of port wine then gradually passed into the hands of a few English firms. To counter this English dominance, Prime Minister Marquis of Pombal established a Portuguese firm receiving the monopoly of the wines from the Douro valley. He demarcated the region for production of port, to ensure the wine's quality and thus making Porto the first wine in the world to receive demarcation status (DOC- Controlled designation of origin). All the DOC Port wine must be made from grapes grown in the Douro valley and then the wine is transported to the Vila Nova de Gaia to be aged. The Port wine has a sweet aroma and this owes to the fact that the sugar content in the grapes is not allowed to be fermented for longer periods of time. The suspension of the fermentation process is assured by adding a distilled beverage such as brandy, grappa or gin to the grape extract. 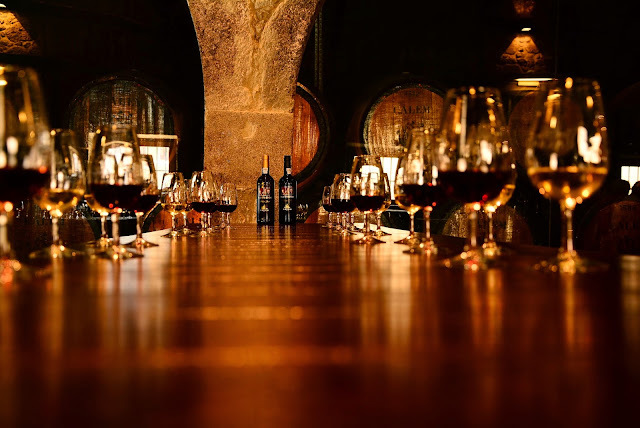 This gives the alcohol content to the wine, however retains the sugar content of the grapes and thus results in sweet fortified wine, the novo Porto (new Port wine). This is the sweetest variety of Port wine. The novo Porto is then transported, historically by rabelo boats and currently by trucks to the caves (cellars) in Gaia to be aged. All Porto (DOC) must be aged in Gaia and it being located on the left bank of the mouth of the Douro has a cooler moist climate which is ideal for its aging. The aging takes places in wooden barrels where the fortified wine is oxidized in presence of air left in the barrels before sealing them. If the wine is aged in small barrels with a larger surface of the liquid exposed to the wood and air inside the barrel, it takes a yellowish brown tinge and gets a nutty flavor giving rise to the Tawny Port wine. Most of them are aged for 10, 20 or 40 years and this gives the Porto its characteristic taste. The Ruby port, a cheaper variation is aged in larger wooden barrels or metallic ones to prevent the oxidation and has a darker color than the Tawny. White Porto made in the same process but from the white grape variety is also very popular. We came to know (and most restaurants here in Porto strictly follow it) that white Porto is meant be to an aperitif while the red one is to be accompanied with a dessert. The most prized varieties of Porto are the Vintage and the Late bottled Vintage (LBV). On certain years, depending on the weather conditions the grapes grown take a special characteristic taste and this is not allowed to be ruined by aging in wooden barrels and thus the Novo Porto is stashed up in glass bottles and left to age in the bottle in horizontal position giving rise to the vintage wine with the vintage year marked on the bottle. The LBV discovered accidentally however is allowed to be aged in wooden barrels for 2-4 years and then it develops a taste that can please the senses even more. 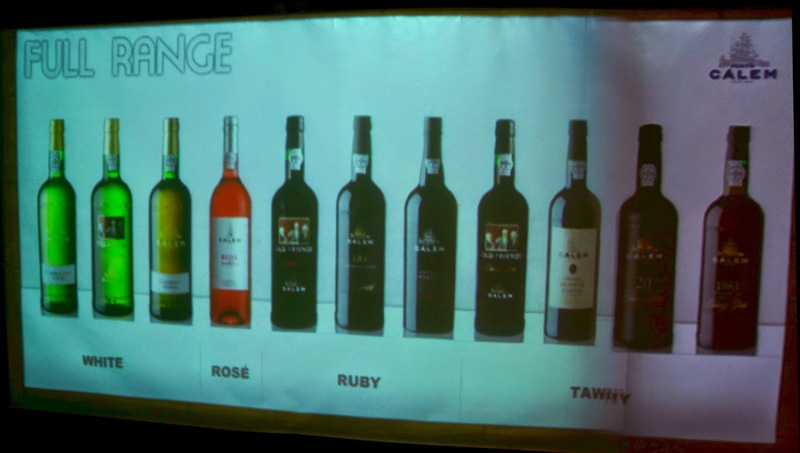 We did not waste this opportunity to try out all the possible varieties of Porto and we must say every wine is different from the other. 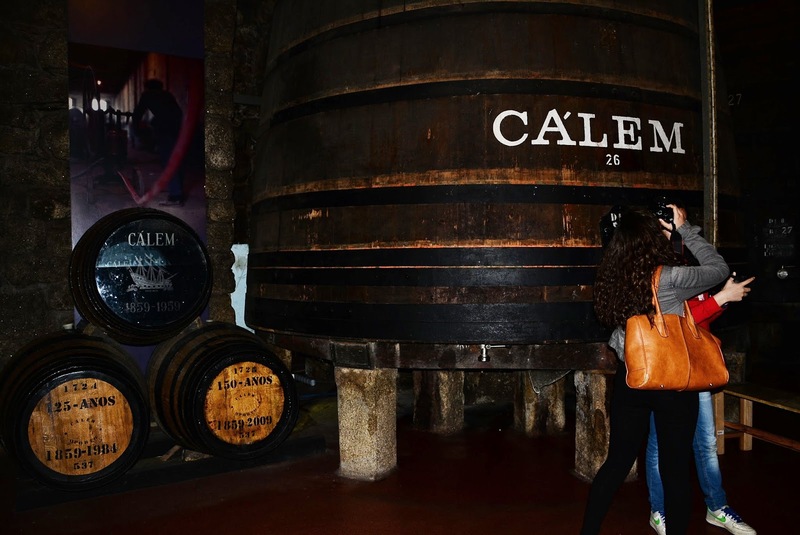 Our knowledge about the Porto was enriched after a visit to the cave of the Porto house of Calem. Then we also tried out some wine tasting at other houses such as the Quevedo, Dows and Porto Cruz and of course got back a bottle for ourselves from each of these houses. After living in France, known for its wine making and having tried out various varieties of wines, fortified wines and ciders we can safely conclude that there is nothing called a good wine or a bad wine, it just may suit or not suit ones tastes. For us we were not blown away by the wine of Douro region, but when the same is fortified, the resulting Porto is a drink to relish.